I am LOVING these Cupcake Cake Ideas that you can try today! There are 20 Amazing Pull Apart Cupcake Cake Recipes to try so check it out! 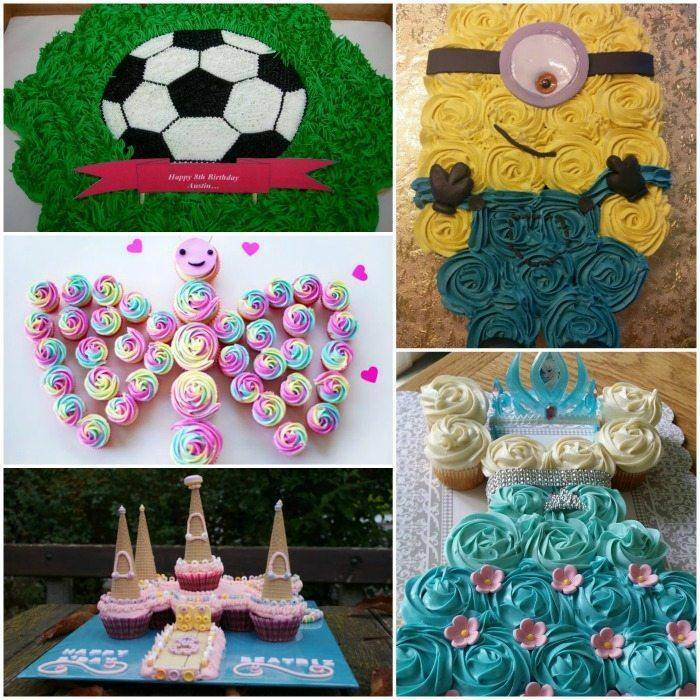 Check out these amazing Cupcake Cake Ideas for Birthday Parties, Wedding Showers, Baby Showers & More! I have 20 great recipes for you below! Here is a super adorable Rainbow Butterfly Cake that will be a big hit with your little one! I am loving this AWESOME Elsa Cupcake Cake and so will your little Frozen fan! This Cupcake Castle makes a super adorable cake which is perfect for any little princess on her birthday! Here is a fun one for your little athlete, this Pull Apart Soccer Ball Cupcake Cake is perfect for your soccer player and easy to make! YUM! Any little Minion Fan will ADORE this awesome Minion Cupcake Cake and you don’t have to take the time to cut the cake or deal with plates and forks! RELATED: 25 Awesome Unicorn Poop Recipes To Try! This super cute Pull Apart Wedding Dress Cupcake Cake is perfect for a bridal shower, it’s super cute and easy to make! This awesome Rainbow Cupcake Cake will brighten up any party and it’s super easy to make! If you’re wanting a super cute pull apart cake for your wedding, be sure to give this great Peacock Wedding Pull Apart Cake a try, it’s adorable and perfect for a wedding! This Teenage Mutant Ninja Turtle Cupcake Cake is AWESOME and it will definitely be a favorite of your little TMNT fan! This Hello Kitty Cupcake Cake is sure to be a big hit with your little Hello Kitty Fan, so be sure to give it a try, these pull apart cakes are so much easier than regular cakes! I am loving this adorable Gumball machine Cupcake Cake, it’s the cutest and perfect for any occasion! If you’re hosting a baby shower, here is the perfect cupcake cake for you, this pull apart baby buggy is super adorable and it’ll be a big hit at the baby shower! This awesome Unicorn Pull Apart Cake is pretty simple to make plus it’s adorable and perfect for any unicorn themed birthday party or a class party! This super cute Cow Cupcake Cake would be perfect for a farm themed birthday party! This is a fun spin on things, you can make a cupcake shaped cupcake cake, it’s super cute and easy to make! This pull apart Fish Cake is super adorable and easy to make, plus if you got a little fishing fan, they’ll definitely love it! This Engagement Ring Cupcake Cake would be super cute for an engagement party, bridal shower or even a wedding! I am loving this Birthday Flower Bouquet, it’s perfect for any age! 10 Summer Freezer Meals for the Grill in Under an Hour!